I have a question about bonding. Mine has come a long way since the first day I got her. She still crabs at me in her pouch but she'll allow me to put my hand in there with her and she'll fall asleep with it. I happened to watch a YouTube video about bonding, it was some vet. He said a good technique would be to cup them in between both your hands. Is this a good idea, or will this freak them out? I noticed some of the info in his videos are questionable. I'm guessing you have a single glider. Young joeys really don't care to be held, especially during their playtime at night. Since they are naturally nocturnal. Your little one is probably scared, and will crab. It is best to let him know you are approaching his cage, and he will crab till he gets used to you. Have you considered getting him a buddy, or are you able to keep him company during his awake time? They are a colony animal. Some do well as singles especially if they get plenty of attention, and have a glider safe wheel, and enrichment toys. They do get bored, and things need to be changed around a bit. Any word you see in blue you can click on and find more info. bonding is an on going process, and each glider is unique as to how quickly they bond. The portion I highlighted in green is very good progress even though she may still crab a little at first. I don't like the double hand cupping method highlighted in red because it makes the glider feel trapped in your hands. You don't ever want to force a glider to do anything. No I got 2 sisters! I'm just specifically talking about one because the other is already a sweet heart. One is scared and tends to act like she hates me. Lol. But like I said, I'm making progress. But thank you! I've researched a lot and the vet started talking about things like heat rocks, and to not feed them things like BML because pellets have come a long way, and now has all the nutrition they need. And that things like BML are too complicated and made my "amateurs" I feed mine BML. Lol. The last strike was that he suggested glide-r-chow.. Pocket Pets food. After that I was very suspicious of what he was saying. I just wanted to make sure. He also would pick them up and pinch their head in between his thumb and finger. It all just looked fairly rough. When it comes to bonding, it's common for one to be more bonded than the other at first. Each glider is unique in personality. It may take more time with your shy one. They kinda work with the "monkey see monkey do" mode. She just needs to learn to trust you. As far as diet, yes, kibble today has come a long way. 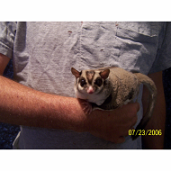 However, sugar gliders teeth don't continually grow like rabbits, hamsters and other rodents. They are marsupials and like us. They have one set of permanent teeth. There have been several diet studies done in recent years that haven proven to be more healthy than offering a dry kibble. 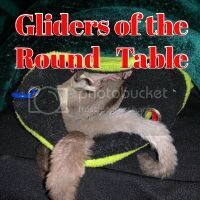 The BML diet is in the top 3 as one of the best diets for gliders. It has unsoluble fiber that gliders require and the calcium to phosphorus ratio ( 2:1 ). Kibble is great as a snack to be offered during the day. Heatrocks are not recommended for gliders. If there are two of them, and they have a sleeping pouch and maybe a few pieces of fleece, they will keep each other warm, unless the room temp is cooler than what is comfortable for you. I don't like the cupped in your hand and away from your chest method.You also should look at what you are going to do next. You can't hold your hands out in front of you for very long or get up and walk around. Also if baby/adult baby gets squirmy it is harder to keep them from jumping off or escaping. I prefer to have hand in pouch and my hand over the glider. This also kinda rolls into next step for me which is holding on chest under my cupped hand(s). If sugar glider gets active all I have to do is kinda roll top hand over top of baby/adult and they can't get away, loving of course. I also can get up and walk around and do things one handed(after little one is comfy and secure on me). This is a link to show how hands are over glider and semi open hands. Thank you for the visuals, Art. You and I both agree we don't like the method where the glider feels trapped in the hands. Your way (and mine) still lets the glider see yet gives the owner some control. You are still able to pet and move with them. Thanks so much for your post, Art.